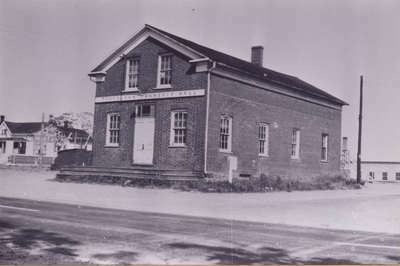 Trafalgar Township Hall, located on the south-east corner of Trafalgar Road (Seventh Line) and Dundas Street. It faced the Dundas Highway and it ran north/south along 7th Line (now known as Trafalgar Road). This photograph was taken in about 1940. It is the first Hall, a newer one was built later in 1949. It was originally built as a store in 1847, when the Dundas Highway was heavily used as a travel route between Toronto and Dundas, Ontario. Another photograph of the old hall is linked here for your further information. Also, a photograph of the newer building, which faced the intersection (or north-west) is linked here. The hamlet at this intersection was first called Post's Corners, then Postville. For more information on the history and development of this intersection, please see the links here to "Early Ward 5 History" by the Trafalgar Township Historical Society, and also our digital record of the old Post Inn turned to gas station, store and ice cream booth on the south-west corner of the intersection.